This full day excursion from Paris gives you the chance to discover three of the Loire Valley's most famous châteaux: the sophisticated Château d'Amboise, the charming Château de Chenonceau, built across the River Cher, and the majestic Château de Chambord. After lunch, your driver-guide will take you on to the Château de Chambord, the largest of all the Loire Valley châteaux. It was built for King Francis I of France in the 16th Century with the help of none other than the great Leonardo da Vinci. Take advantage of the opportunity to explore this spectacular château. See its extraordinary double helix staircase and panoramic terrace with a sea of monumental chimneys overlooking the château's grounds. Approximately one and a quarter hour's visiting time. The exhibition "The death of Leonardo da Vinci" will discuss about the relationship between Leonardo da Vinci and his patron, King François I. 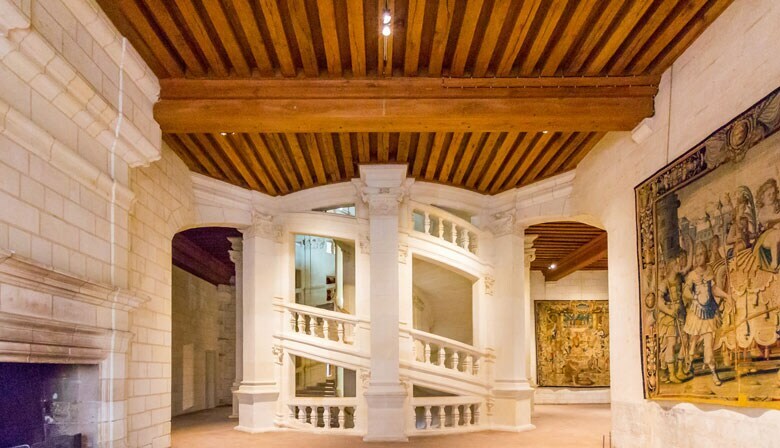 The painting representing "The death of Leonardo da Vinci'" by François-Guillaume Ménageot will be exhibited at Amboise castle, from May 2nd to September 2nd and in collaboration with the French National Library. Some street-art works realized by the Italian graffiti artist Andrea Mattoni will also be exhibited. Chambord castle celebrates its 500 years and organizes a retrospective on the unique architecture of the building, from May 26th to September 1st. 150 works will help you to better understand the project of the King and his artist. The technical prowess will also be explained in detail .Chambord also launched a contest for the best architecture schools in the world, with the aim of thinking about Chambord in the future. The results of this contest will also be exposed. Great service and tour. Tour guide was very knowledgeable. Gorgeous day! Very relaxing drive and just the right amount of time in each location. Our driver was wonderful. He was fluent in several languages and always on time. We had a really nice lunch during the second stop with the group. It was lovely! My favorite was Château de Chenonceau. If you like castles and the countryside, this is a beautiful and relaxing tour! The chateaux were beautiful. The driver was about 15 -20 minutes or so late in picking me up. He was very nice, and had a lot of knowledge. I just wish I would have known that "steak" meant ground burger. Pamela was an excellent guide, very knowledgeable, accommodating, experienced, friendly, and certainly provided the guests with a wonderful tour. Beautiful castles, but the driver was horrible. The chateaus were marvelous, each unique in their own way. The driver provided great background information prior to our arrival, escorted us to the proper entry points, provided instructions on meeting points and times. Excellent tour, and excellent lunch! I highly recommend this tour.